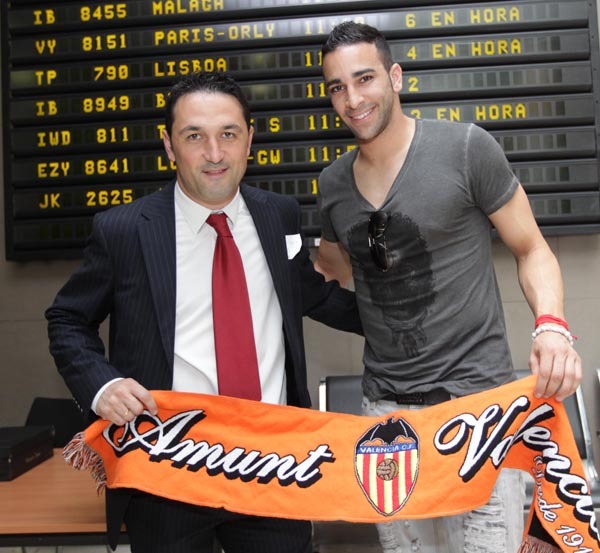 Today French international Adil Rami was officially presented as a new Valencia CF player and basically the first reinforcement this summer, although his contract has been achieved since the winter transfer market. Adil Rami signed for some fans, there was a lot of reporters, of course Valencia CF technical secretary Braulio Vazquez was there and he went through a sort of fast medical, which is more of a ceremonial thing that anything, as he has previously gone through extensive medical tests. He spoke shortly to the media and had this to say:""I am very happy to be in Valencia. For me it is an honor to be in this club. Amunt Valencia." Adil Rami has had a great season with Lille with whom the won the French league and French cup and has played all of Lille's matches, except few when he was injured. Tomorrow Adil Rami and Joma will have a big reveal in which the new Valencia CF dress will be revealed and Adil Rami will be the model obviously. The new dress is expected to be in the colors of the region Valencia.